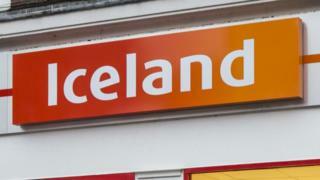 Iceland has been named the UK's top supermarket for customer satisfaction for the first time. The UK Customer Satisfaction Index surveys 10,000 consumers, is released twice a year, and covers all types of business. Iceland came 10th overall - the highest performing food retailer - while the online giant Amazon came top of the list for the sixth time in a row. Waitrose was 17th while Aldi and M&S Food were joint 23rd. Amazon scored 86.7 out of a potential 100. John Lewis came second, getting 86.5 out of 100. In January, Waitrose was the top-performing supermarket; last July, it was Aldi. A separate survey for Which? in February named Aldi as the UK's best supermarket. Alongside Yorkshire Bank, First Direct, Nationwide and M&S Bank all featured in the overall top 10 of the customer satisfaction survey. The banking sector performed better than ever, scoring 80.4 in comparison to its average overall score of 77.9. But Institute for Customer Service chief executive Jo Causon warned that a slight fall in customer satisfaction across the board "should be of concern for the UK economy". "Nine months from Brexit, we need more than ever before to show that Britain is a great place to do business with and in," she said.